H.E. 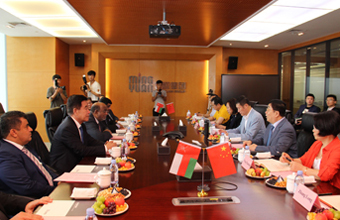 Yahya bin Said bin Abdullah Al-Jabri, Chair of the Special Economic Zone Authority in Duqm (SEZAD), invited the Mingyuan Group, a petrochemical conglomerate, to invest in Duqm during a meeting with the Group's officials during his visit to Dalian city, China. Ji Hongshuai, Chair of the Group, welcomed the invitation and expressed the Group's aspiration to invest in SEZD. The Group has an oil refinery and a number of petrochemical projects in the petrochemical industry zone in Dalian. The meeting discussed a number of aspects of the company's investment in Duqm. The Chair of Mingyuan Group emphasized that the petrochemical project the company wishes to implement in Duqm is a specific gas-based project. H.E. Yahya bin Said Al-Jabri welcomed the Group to invest in SEZD and promised to provide the Group with all possible facilities. He also proposed forming a joint working group of the Group and SEZAD to discuss the various details and achieve the objectives of both parties from this investment. SEZAD is seeking to implement quality projects in SEZD that will provide a good addition to existing projects and contribute to the provision of work areas for small and medium enterprises and providing suitable and rewarding jobs for citizens. The Sultanate's current five-year plan focuses on the manufacturing industries industry sector as one of the sectors that contribute to economic diversification. During his visit to China, Al Jabri visited the petrochemical industry complex of the Mingyuan Group and learned about its capabilities and plans to expand its existing project in Dalian.